Claude Monet (1840-1926) was both the most typical and the most individual painter associated with the Impressionist movement. His long life and extraordinary work were dedicated to a pictorial exploration of the sensations which reality, and in particular landscape, offer the human eye. Monet`s poplars, grain stacks, Rouen Cathedral, and waterlily paintings - among the most beloved works of the Impressionist period - were created long before the currents of the contemporary avant-garde and had an inestimable influence on the development of modern art. 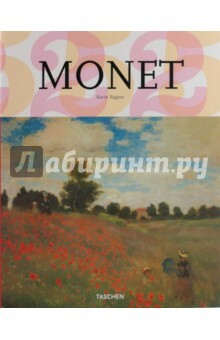 This book traces the life`s work of one of art history`s most beloved painters. Karin Sagner-Duchting studied art history, modern German literature, and classical archaeology at Munich University. She received her doctorate in 1983 with a thesis on Claude Monet's water lily paintings and was academic assistant at the Bayerische Staatsgemaldesammlungen until 1988. Based in Munich, she researches and publishes in the field of 19th-century art.